Former First Lady Rosalynn Carter has worked for more than four decades to improve the quality of life for people around the world. Today, she is a leading advocate for mental health, caregiving, early childhood immunization, human rights, and conflict resolution through her work at The Carter Center in Atlanta, Georgia. The Center is a private, nonprofit institution founded by former President and Mrs. Jimmy Carter in 1982. A full partner with the president in all the Center’s activities, the former first lady is a member of the Carter Center Board of Trustees. She created and chairs the Carter Center’s Mental Health Task Force, an advisory body of experts, consumers, and advocates promoting positive change in the mental health field. 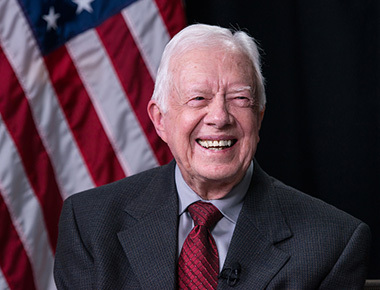 Each year, she hosts the Rosalynn Carter Symposium on Mental Health Policy, bringing together leaders of the nation’s mental health organizations to address critical issues. Mrs. Carter emerged as a driving force for mental health when, during the Carter administration, she became active honorary chair of the President’s Commission on Mental Health, which resulted in passage of the Mental Health Systems Act of 1980. She served on the Policy Advisory Board of The Atlanta Project (TAP), a program of The Carter Center addressing the social ills associated with poverty and quality of life citywide, from the program’s inception in 1991 until its transfer to Georgia State University in 1999. In 1988, she convened with three other former first ladies the “Women and the Constitution” conference at The Carter Center to assess that document’s impact on women. On February 7, 1979, Rosalynn Carter testified on behalf of the President’s Commission on Mental Health before the Senate Subcommittee on Health and Scientific Research. She was the second first lady to appear before Congress. Outside the center, Mrs. Carter is president of the board of directors for the Rosalynn Carter Institute for Caregiving (RCI), which was established in her honor on the campus of her alma mater, Georgia Southwestern State University, in Americus, Georgia. Through research, education, and training, the RCI promotes the mental health and well-being of individuals, families, and professional caregivers; delineates effective caregiving practices; builds public awareness of caregiving needs; and advances public and social policies that enhance caring communities. A mother of four, with 12 grandchildren and 10 great-grandchildren, she has maintained a life long dedication to issues affecting women and children. In 1991, she launched with Mrs. Betty Bumpers, wife of former U.S. Senator Dale Bumpers of Arkansas, Every Child By Two, a nationwide campaign to protect children from vaccine-preventable diseases by raising awareness of the critical need for timely infant immunizations. She also works with Habitat for Humanity, participating in the annual weeklong Jimmy and Rosalynn Carter Work Project that in 1984 began building homes for the needy, and Project Interconnections, a public/private nonprofit partnership to provide housing for homeless people who are mentally ill. She served as distinguished centennial lecturer at Agnes Scott College in Decatur, Georgia, from 1988-1992 and is currently a distinguished fellow at the Emory University Department of Women’s Studies in Atlanta. Since graduating from Georgia Southwestern College in 1946, Mrs. Carter has received many honors, among them the Volunteer of the Decade Award from the National Mental Health Association; the Award of Merit for Support of the Equal Rights Amendment from the National Organization for Women; the Notre Dame Award for International Service; the Eleanor Roosevelt Living World Award from Peace Links; the Kiwanis World Service Medal from Kiwanis International Foundation; the Jefferson Award from the American Institute for Public Service; the Georgia Woman of the Year Award from the Georgia Commission on Women; the Rhoda and Bernard Sarnat International Prize in Mental Health from the Institute of Medicine; the United States Surgeon General’s Medallion; and the Presidential Medal of Freedom, America’s highest civilian honor. In 2001, she was inducted into the National Women’s Hall of Fame. She has written five books: her autobiography First Lady from Plains; Everything To Gain: Making the Most of the Rest of Your Life, a book about life after the White House co authored with President Carter; Helping Yourself Help Others: A Book For Caregivers (with Susan K. Golant); Helping Someone with Mental Illness: A Compassionate Guide for Family, Friends, and Caregivers (with Susan K. Golant), which was selected as the winner of the 1999 American Society of Journalists and Authors Outstanding Book Award in the service category; and Within Our Reach: Ending the Mental Health Crisis (with Susan K. Golant and Kathryn E. Cade). She continues to travel and speak throughout the world, is a deacon at Maranatha Baptist Church in Plains, Georgia, and enjoys fly-fishing, bird-watching, swimming, and biking in her free time.